Imagine Yourself as a Redesigner . . .
You drive up to your client's home in your red convertible Ferrari/BMW/Mercedes. Your hair is windblown but you don't care. Your hairdresser cut it so all you have to do is run your fingers thru it, and presto, it's back in place. You have no Monday blues because you love what you do. Your husband comes home early because you called him and invited him out for a romantic dinner at your favourite restaurant - you're thinking about the candle-lit table, fragrant flowers and real silverware - he's thinking about what comes after - and you smile as you know your decorating business is picking up the tab. You've grown to be so creative and confident, you walk with a different air - a different aura about you - your friends can't figure out why you're so happy now. You gather the kids and husband around the fireplace. They're all wondering why you gathered them together. You pull out the credit card statements showing a zero balance and together you throw the statements into the fire and celebrate. Well, you throw copies of the statements into the fire and keep the originals for tax purposes. You put on your favourite black signature dress, pick up your Prada bag with the gold trim, and meet your husband at the real estate office, where you sign the closing documents on your new home - all neatly affordable because your redesign/home staging business is making you secretly rich. The envelope arrives in the mail. You whisk it out of sight and open it. You smile as you pull out the first class tickets to Tahiti for two. You can't wait to give them to your parents at the anniversary celebration on Friday. You were patient. You were tenacious. You were willing to work extra hard, even on weekends sometimes. Now the moment has arrived. You walk into your boss's office and slide the letter of resignation across the desk. Without a word, you whirl around and walk briskly out of the office for good. A client calls up and wants you to redesign their living room on Thursday afternoon. But you can't. Joey has a soccer game that afternoon and you don't intend to miss it. You tell the client you already have an engagement and schedule the appointment for Monday instead. You look at Joey and smile. You arrive at the homeowners house. It looks pretty run down on the outside, so you know you've got your work cut out for you on the inside. Sure enough. The place looks pretty messy - but you know exactly what needs to be done. You roll up your sleeves and get to work removing accessories, decluttering the space, organizing what will be left, rearranging the furniture. . . . A week later you hear from the real estate office that the house sold in one week after you staged it when it had been on the market for 3 months before you with no offers at all. You smile. It's a good day. You've moved the sofa to the middle of the room. You put it at just the right angle and distance. As usual, the rest of the room seems to just fall into place. Your client exclaims, "You make it look so easy!" You wink at your associate knowing you've never been stumped by a room yet. It's the end of a creative day. You've laughed a lot. You're sweaty and tired. The client is walking around smiling, looking kind of dazed and marveling at their "new" home. You feel a wonderful sense of pride and fulfillment sweep over you and almost feel guilty taking your fee. But you take it anyway, knowing that you've created a beautiful environment for a stranger which is going to positively impact that family for as long as they live there. Who else wants to start an interior redesign business and make money arranging furniture for others or providing home staging services for homeowners selling their homes (yep, we have that too)? Need extra income to overcome the high price of gasoline? Would you love to work from home at your own schedule? Looking for a prestigious position that's creative and fun? Tired of your credit card debt, living from paycheck to paycheck? Need an escape from housework and children that will pay you for your creative talent? 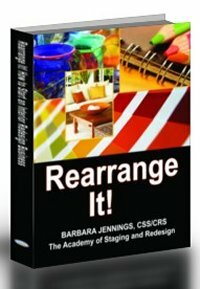 Three Levels of Exclusive, Affordable Tutorials in the Comfort of Your Home - Or Career Level Courses - plus a business listing in The Academy of Staging and Redesign - Directory, the fastest growing on the internet - driving thousands of visitors every month to possibly contact you for your services! Start immediately while it's still a ground floor opportunity. Don't let someone else in your town beat you to it. Ground floor opportunities in a ground-breaking interior design field come along once in a hundred years. Time is of the essence. Start now and become the first in your town. Or maybe you just want to learn how to rearrange the furniture you already own and turn your space into a dream home instantly? Embarrassed about your living room or family room? Tired of moving things around endlessly with unhappy results? Unsure of what to do to blend furniture and accessories that don't seem to go together? Want to learn how to hang art, mirrors, shelves and pictures like a professional? Want to decorate instantly without spending a fortune for real, workable solutions? If you just want to redecorate your own home, click here: Decor Secrets Revealed or check the links at the top of the page under Exclusive Training for the decorating training available. If you're interested in a career in interior redesign, keep reading. May I Give You My Free Newsletter? Be sure to use "back" button after submission to return to this page. "I’m going to hand you the easiest and most affordable way to start your own lucrative interior redesign business and get you ready to start making money within a matter of days, not weeks or months. I'm going to take you on an elevator to the top when it comes to learning the redesign business! I'm talking about virtually all of the essential concepts, tactics, strategies and insider tips you could possibly use to make the kind of money you've always wanted in a very creative, fun decorating business of your very own. – All for a TINY fraction of the time and money you would have to spend if you attended a seminar or class! Why climb 50 flights of stairs when the elevator is working right here, right now? The ability to tailor your training to meet your own needs. We all come from different backgrounds and levels of experience, so some people may not need all of the training components that others need. You decide what works for you. We have 3 different levels of training: Bronze, Silver and Gold. More details later. The ability to train at your own pace rather than being rushed through a seminar or class that is timed to meet the instructor's schedule and not yours. The ability to save thousands of dollars on your training compared to what most trainers are charging and yet, as impossible as it may seem, get even better training than any place else. The ability to be trained by a seasoned expert in the field who has trained hundreds of people just like you into rewarding part time or full time careers. My name is Barbara Jennings and I'd like to talk to you "heart to heart". I am the West Coast Pioneer in the Interior Redesign field and I've been successfully creating beautiful homes for clients since 1986. Would an extra paycheck help this month? Would you like get away from the housework and kids once and a while and have some creativity in your life? Would you like to replace your job and be independent in a rewarding, decorative and exciting career opportunity? Work with clients to simply rearrange the furnishings they already have to give them a more intimate, cozy, professional arrangement like the one below. The client's sofa and chairs were not directed in the right way and created what we call "screaming distance" in the room. A professional arrangement service corrected the problems and the client was very, very pleased with the end result. Does this sound like something you would enjoy doing? If you’re one of the lucky individuals to discover this letter – I’m going to show you how to make a living getting paid to do what you love to do - decorating - and how you can break into this ground floor opportunity now while it is just on the verge of exploding. Hello Barbara! I just wanted to send you the link to my company's website . . . and say thank you again-without your wonderful training and guidance, I don't know if I would've gotten to this point! I officially opened for business yesterday, and through word of mouth I have 2 appointments booked for this week, and a presentation booked for next week with a new real estate company! - Shelly Landry"
"I have been reading the manual and although I am pretty confident with my limited decorating abilities, it is great to know that i am on the right track. I can't put it down!! If I had discovered your website earlier, I could have saved myself a whole bunch of $$. . . . I can't believe that you would have time to write that incredible manual and still do all the other stuff!! - JOY"
Reason #1: You have practically no competition. Ground floor opportunities don't come around all that often but when they do you need to act immediately or someone else will benefit and you'll be left out in the cold. Reason #3: You can work from anywhere you wish. Most redesigners work from their homes. It doesn't matter because you go to the client and the client never sees your "office". Reason #4: You can set up your business to fit your lifestyle and that of your family (that's how my business is set up right now). Reason #5: No need for employees. I have absolutely zero employees (it's just my part time associate and me running the whole show yet I make a six figure income) and I couldn't be happier not to deal with all those headaches and hassles. When I need something done I simply outsource it. Reason #6: Incredibly low start up costs. You don't need to carry any inventory (unless you want) and you can operate your business in any spare space you have at home. Reason #7: You get paid over and over again for work you've probably been giving away for free to friends, family and associates. Isn't it about time you got paid for all that natural creativity and passion? But There Is A Big Glaring Problem! You see, once most people hear about all these benefits of starting their own decorating business, they run around all excited and motivated to give it a go…. but sadly a huge number of them fall flat on their face trying. They don’t know how to find their target market interested in paying them to decorate, they choose the wrong approaches, they don’t know how to sizzle their services plus they make lots of other mistakes that lead to nothing but frustration. I want to do something about that. The most affordable and complete training program anywhere in the country, bar none. The heart of the training is an electronic (or 2012 176-page printed manual, 8-1/2x11) that lays it all out in an easy to understand manner and in an easy to follow sequence. For those of you who also need training in actual interior design concepts, I have created a second electronic book of 25 chapters to ground you in the essential arrangement skills you will need to feel confident and make your clients thrilled. And now you'll also get a free business listing in The Academy of Staging and Redesign - Directory, the fastest growing directory on the internet, attracting thousands of visitors every month. Review from Midwest Book Review - "Any library strong in either interior decoration or business titles simply must have REARRANGE IT! The author's been professionally rearranging homes in California since 1986: her home-based designer tips lend perfectly to those who would operate and foster home-based work while her case studies of clients, tips on what to charge and how to rearrange, assessments of what homeowners need most, and how to turn a chaotic home feel into a design masterpiece makes for clear, specific suggestions. While those selling homes and real estate agents will find this of key interest, so will both those seeking to make a business of home arranging and homeowners just seeking a more logical arrangement, making for a wide-ranging recommendation suitable for any public lending library." After the first 2, what next? The critical difference between home "staging" and "redesign"
There's a lot to learn but it's all laid out for you in a sequence that makes sense and written so that practically anyone can understand it easily and instantly. You can always get your questions answered immediately just by filling out one of our forms and submitting it by email or picking up the phone and calling us. To help you further, I'm also including 33 furniture arrangement layouts that will solidly help you resolve just about any rearrangement dilemma you'll ever face in a living room or family room. So if you're ever unsure of where to begin in a client's home, simply refer to these pages for guidance on how to arrange the furniture. It's just like going to 33 homes and actually setting up the main seating arrangement for the living room or dining room. What can I say? This is powerful stuff! Plus your exclusive business listing in The Academy of Staging and Redesign - Directory, which we brand every month with thousands of dollars of internet advertising, driving thousands of visitors daily. If you want to do business, being listed is just one more way we help you succeed. If you have had little to no background in interior design concepts, it is strongly recommended that you also acquire our eBook (Decor Secrets Revealed - 25 chapters) devoted solely to furniture and accessory arrangement techniques and concepts as well. More on that later. What’s more, to make sure you get all the support you need afterwards, I'll be giving you my private email address to write for any questions you may have for your particular business, no matter where you're located. Just the ability to have your own personal mentor no farther away than a click of your mouse is worth the whole price of the training itself and more as my time is very valuable. Plus, so you can feel completely confident in what you'll learn, I'm including a 10-day refund on any eBook you ever acquire from me so you can rest assured you're in good hands with no risk whatsoever. Trust me, you’ll be glad I took this extra step because, unlike my competitors, I don't want to keep your money if you feel you haven't received full value or you're unhappy later on. With Rearrange It! you get the equivalent of 145 pages worth of powerful training (in my eBook format which you read on your computer - or in the printed version) in how to set up your business, and most importantly of all how to market your services so you can get paid for your creative talents. And to help assure your success I've also included examples from my own very successful redesign business. You probably don't know it, but I am the West Coast Pioneer in Interior Redesign, having begun offering this service in 1986, long before it became popularized by Oprah or the cable TV shows. You see, I'm also the author of a best-selling eBook called “Decor Secrets Revealed!” And that's not all, I've also authored the popular softcover book "Where There's a wall - There's a Way", "Pro Art Consulting" (I'm also a seasoned expert in corporate art consulting), "Great Parties", "Advanced Redesign" and "The Secret Art to Hanging Art". I'm the owner and developer of this website and have written all of the over 200 pages of free tips you'll find here. "My partner, Deborah, and I have been doing this for years and finally decided to get paid for it. We read your eBook and it has helped us launch a very successful redesign business. No one else in our area offers these services! It is really like getting paid to have fun! . . . With newspaper articles and speaking engagements, we have created a "buzz" in our area (previously untapped market) and are desperately trying to keep up with the calls. Thank you for all your help! - Lisette Dell'Apa"
Can people learn interior redesign from an online course or a book? Absolutely, unequivocably YES!!! Why do you think so many colleges and universities are now offering online courses to students like never before in a wide variety of subjects? Why is the book publishing business a multi-billion dollar industry? Every year there are more and more classes going online. The students benefit in a multitude of ways, such as lower fees, total flexibility, total convenience, the ability to work at their own pace, the ability to get a 1:1 student/teacher ratio. My daughter took 3 online courses in college and they were excellent classes, which she enjoyed very much and learned a tremendous amount. Interior Redesign is being taught very effectively online as our many students will attest to so don't let anyone try to convince you that it isn't effective. It most certainly is effective - and best of all it's the most affordable way to learn too. Are people really making money in this field? Yes, some are extremely successful (like myself) and others are making fantastic supplemental income. There are millions and millions of households with a dire need for this type of service. Someone's got to help them - why not you? Why not now - while it's still a ground floor opportunity? Each person brings their own uniqueness to the equation. We all know different people, come from different backgrounds, have had different levels of training in a wide variety of areas, have different goals and desires, different work ethics, different personalities and living in different areas. That's one of the reasons that makes redesign so intriguing, so easy to learn, so profitable. Here's a recent testimonial I received from one of my clients: "I am extremely happy with the redecoration of my living room. Due to it's odd set-up, it was very difficult to arrange the furniture to make the room look appealing and put together. Now, not only is it appealing and put together, it is perfect to entertain as well as make the most of the features of the room. Barbara and her assistant were wonderful to work with and they worked with my style rather than try to make me conform. Thank you. 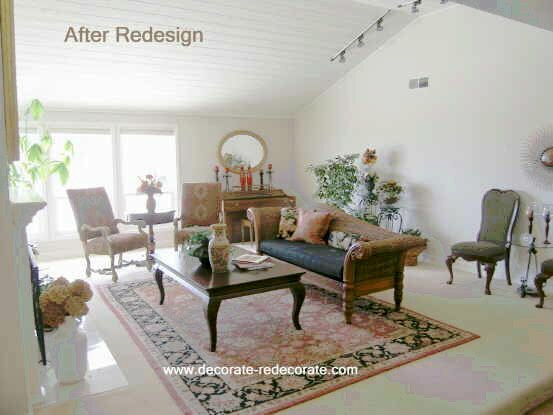 - Desiree K., Laguna Niguel, CA"
Three days later I did another redesign for a lady in Riverside which included a complete rearrangement of her family room and living room. She was from Egypt and it was a wonderful experience working with her huge array of Egyptian figurines and objects d'art in her lovely home. She was thrilled with the end result and wants me to come back soon to work on her bedrooms. I love this business! 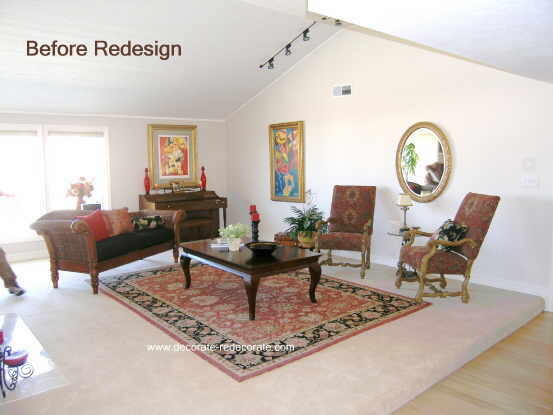 Here's another client said two days later about a redesign I did for her: "Barbara had redone my family room and living room. Incredible work . . . what a talent . . . Room look more spacious with an artistic taste to fine design. Great personality and works with home owners in a friendly fashion. I love her and I love her work and I'll recommend her work anyone to who wants great taste. - Nardine I. , Riverside, CA"
Is it fair to compare redesign training with becoming a full service interior designer, a surgeon or a minister? Of course not. The interior "redesign" business is very easy. That's why no degree is needed, not even a 2-year degree. You move the sofa from Point A to Point B. You move the coffee table from Point C to Point D. You just have to know why Point B and Point D are better than Point A or Point C. Yes, you need to know some important interior design concepts so that you do a beautiful rearrangement for your client, but it's not the same as doing surgery on someone's gall bladder, so don't be fooled into believing it's a difficult process that can only be learned in a face-to-face classroom. I wasn't trained that way. When you become an adult you develop many different capacities of learning and no one should make you feel you can only learn their way. Do I need a degree in interior design? No, you don't need a degree. You're only going to be rearranging the furniture and accessories that your clients have already purchased. You're not going to be directory2@barbarajennings.comocking down walls, doing a retro fit, tearing things or building things that you need a license and permit to do. You'll be giving them a one day redesign of a room in their home. That's going to consist mainly of moving their furniture around and rearranging their art and accessories and giving them some basic advice. You won't be doing anything that you need a license to do, much less a college degree. It's a simple concept. Don't let anyone make you believe it's tough and you have to be certified to do this. Do I need to be certified? No, you don't need to be certified by me or anyone else. It's not necessary to be certified or a member of any professional association. Anyone can give you a "certification of completion" for perfect attendance at a seminar. Don't mistake that for "certification". I've got a huge list of people building viable, successful businesses and having a lot of fun at the same time. Is this a franchise business? No, this is not a franchise. You will be a completely independent business owner and free to set up and structure your business any way you choose. And without the hefty price tag of $35,000-$62,100 one decorating franchise is currently charging. This is practically a risk-free opportunity in a ground floor business opportunity being routinely popularized by the cable decorating shows. Your entire training fee can be paid for by your first client, no kidding. That gives you a profit almost immediately. Sound too good to be true? Well, it is true, so I guess it breaks the rule. Will I be able to work in any style, any budget and in any home? Yes! Yes! Yes! You will have full control over the type of client you service and how far from home you are willing to travel. Can anyone do this? Yes. People from all walks of life, all ages, all sizes, all backgrounds, all resources are doing it. It's a ground floor opportunity with practically no competition. Obviously, those of you who are creative and have an eye for color and design will feel right at home immediately. Do I need lots of experience first? No, you don't need experience to begin. Your initial experience will come from rearranging your own home and those of your friends. It's a safe environment and very comfortable. You can even service your friends without charge, just for the experience (recommended). After just a few actual rearrangements, you'll be ready to tackle just about any home out there. With our furniture arrangement concepts, you'll easily be able to find an arrangement that will work in most rooms. Not a problem. Do I want to train with a "pioneer of one-day redecorating"?I am the West Coast pioneer in the concept of one-day decorating or redesign, having begun in 1986 in Southern California with no one to train me at all. I know my stuff and I share it all thoroughly and willingly. I have owned and managed successful decorating and design businesses since 1972. Unlike some programs who hire "professional public speakers" to present at seminars or who allow "newbies" to hang out a shingle and promote themselves as an experienced trainer, every word of my training was written by me and is based on my own redesign experiences and expertise, plus a few talented people I have trained. Guaranteed. This training program is now ranked the #1 Redesign Program in the world. There's a reason for that. I train more people in a single month than most of my competitors train in a whole year. And not just because I'm so affordable either. I'm #1 because I'm good at explaining the concepts and showing you what to do and how to do it. "Hi Barbara, I have been passionate about home redesign for 4 years and after completing your training I was able to become a sought after home stager in addition to redesign. Miracles Happen! I am now privledged to work with successful real estate agents in my area. I have an ulterior motive. What is it? To lift my clients spirits and help them provide a beautiful enviornment that is pleasing for personal use or a top dollar sale of their property. Thank you Barbara for helping craft my talent into a profession that offers service to others in a tangible way. As a side benefit of being trained by the best, I will have an article appearing in a magazine next month and have been listed as the home stager referred and selected by some of the most prominent real estate agents in my area (San Luis Obispo, California). All this is a direct result of your training. - Maria Skelly"
Do I want to be trained by an internationally recognized redesign expert, author and artist? 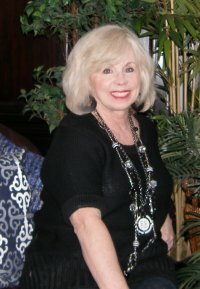 I have written the following books and eBooks, Decor Secrets Revealed, Rearrange It, Pro Art Consulting, Great Parties! Great Homes!, The Secret Art of Hanging Art and Where There's a Wall - There's a Way. In addition, I have received media coverage from numerous newspapers and magazines and have assisted thousands of home owners to improve their interior arrangements. I am an interior decorator, corporate art consultant, graphic designer and published artist with over 30 year's of combined experience -- and my art images are collected by residential and corporate clients throughout the world. As an author, I've been told my writing style is personable, easy to read and understand and I have received numerous compliments on my abilities to communicate and teach. If you find reading this report to be easy to understand, you'll find my training materials are too. Do I want access to the trainer others are trying to copy? When you train with me, you gain the benefit of my most creative, innovative ideas. This is one reason I have risen to the top in this field. I have studied from some of the best marketing gurus in the nation (at a cost of thousands and thousands of dollars) and I pass all of this training to you in easy to understand language. Do I want access to the West Coast Pioneer of Redesign after I complete the training? You will enjoy on-going complimentary access to me by email (even by phone if you want it) so you are never left alone or abandoned regarding your business. Personal responses are sent usually the same day questions are received. You can send me photos to evaluate, call me, write me. Do I want access to the trainer others are trying to emulate? While others reduce their training programs to cut costs, I keep making mine better and better, all at the same very affordable price. I will guide you step-by-step in the right direction. I just got an email from a gal who took the seminar route and then took my training. Here's what she wrote: "I have found your site and information to be well worth the money and wish I would have found you sooner. I have been trying to get (name of her organization) to come up with a more detailed program. They are content with what they have and I was forced to do more research which is how I found out about your site. (Anonymous)"
Do I want to be associated with other redesigners who are professional? I will train you in redesign etiquette and give you the standards of professionalism I expect from myself. The rest is up to you. Do I want to associate with other professionals who believe in educating their clients and respecting their wishes, not promoting their own private style? I want all clients to learn from their mistakes in a gentle, encouraging manner so that they will feel more confident in their decorating choices long after I am gone. I encourage all redesigners to strive for the same goal. Will I be truly independent afterwards and totally in charge of my business? You will be completely independent of any outside interference when you train with me. You will never have to worry about any organization or association placing restrictions on how you run your business, manage your business or promote your business. When you consider the long term effects of total independence, this is a very important ingredient to protect at all times. Do I want all of the above benefits without the hefty price tag and time constraints? My entire training program is tailored to your individual need. If you want just basic training, I have that for you. If you just want advanced training, I have that for you too. You can pick and choose what aspect of the training will best meet your goals based on your personal background and experience. No one else offers such fantastic flexibility. No one else offers the benefits of my Diamond Redesign/Home Staging Training Programs because no one else has all of the expertise, concepts, strategies, and business tools to offer you at such an affordable investment. You won't find anyone who has a program that is as thorough, as broad, as specific, as helpful AND as affordable as mine all rolled into one. That's a promise. Personally I would rather learn this business in the privacy and comfort of my own home with someone who has taken the time and energy to spell it all out to me in great detail electronically and on paper. You might be interested to know about some of the problems reported to me by various seminar students around the country: 1) the rooms in the homes where divided among the class, so no one actually got to work on as many rooms as promised (if you're promised you'll redesign 4 entire homes in 4 days, there just isn't time enough to do that, as it takes on the average 3-4 hours to do a single room); 2) students had definite conflicts of ideas at the homes they visited (something that leads to quite a bit of confusion and tension); 3) students are divided and assigned one room each in a home where conflicts over which furniture should be used in each room arise, making it difficult to arrange the room they were assigned; 4) teachers not receptive to "critiques" that they themselves set up following work on a home; 5) teachers not responding to requests for help in a timely fashion after the seminar is completed; 6) students receiving only a few handouts or little more than one marketing strategy to help them become successful. Frankly, if I'm going to go to a stranger's home to move furniture, I insist on being paid for my time, expertise and energy. But maybe that's just me. I would not want to be placed in a situation where several people are all trying to figure out a solution for the home owner, where they are vying for the same furniture and where multiple opinions can lead to problems and an increased chance of breakage. I like the idea experimenting on my own home first, then of expanding my hands-on training to benefit my friends. I wouldn't want to charge them anyway, so I see that as the perfect way to "practice" before I offer my services to the general public. I don't know about you, but I recognize that I will learn much better when forced to rely on my own mental decision making processes right from the start and that will make be a better redesigner than leaning on the opinions of other "newbies" or a teacher whose ideas might be totally different from my own. Consider this. I also like the ability to learn instantly without having to wait for someone's elses schedule to unfold. And I love not having to worry about whether they will cancel the training because they didn't get enough students leaving me with a useless airline ticket and hotel reservation. One last point. I love it when someone makes full and complete disclosure about their program and backs it with a nice risk-free guarantee. It doesn't get any better than that. And that's what you'll find here, and only here. And those are just a few of the ones that come to mind, but they are worth pondering especially if you're considering attending one of the high priced seminars floating around. You will also be given my direct client-only email address just for those who purchase my training materials so that you can ask me questions that pertain to your own situation. I am a world class trainer - the No. 1 Redesign Trainer in the country - well, actually the No. 1 Redesign Trainer in the world, for that matter. What's that worth? (VALUE: Unlimited) You'll have access to me and all you need to do is send me an email and I'll personally respond right away - usually the same day she gets your email. You won't get some assistant either. You get me. No other author offers you that, just for the price of a book! You see, I recognize that concepts and theories, principles and procedures are great, but sometimes people need more input just for their situation. Without proper application of the best strategies in the world, you'll not gain what you hope to gain. That's why I'm willing, as a special free bonus, to give you extra personalized help. "Wow -- I'm impressed with your quick response and great feedback! My husband found your comments especially interesting, particularly the suggestion to listen to him. Donald has a background in PR (among other things), and he's always telling me to "Give them what they want, not what they need! ", and to streamline my business concept, at least initially. I'm sure I'll have more questions, but I wanted to let you know that I really appreciate your reply. - Diane Tepper"
But that's not all. You'll also get my Current Color Trends Report absolutely free, selling elsewhere on this site for $29.95, with your order of Redecorate It!. If you were to join the Color Board of the United States as an associate member, to find out the direction that color is going over the next couple of years, it would cost you an annual fee of over $600 to get that proprietary information. Decorating industry manufacturers and interior designers have to pay high prices for this type of targeted information, but I've boiled it down into a concise report for you. It's free, with my compliments, just for ordering your copy of Rearrange It!. But even that's not all you'll get. You will also receive my FREE Redesigner's newsletter (VALUE $359 per Year) which will focus on all kinds of concepts, tips and training for starting, developing and managing a home-based business as a redesigner. Right now getting a subscription is FREE with your purchase, however, that could change in the near future, so act now. If you do not wish a business listing, please notify us immediately. Listings will include whatever phone number and email address you use at the time of purchase unless you notify us separately of a different contact means you wish listed. "Dear Barbara, Thank you for getting back with me. I also wanted to take this time to tell you how much I appreciate your monthly letters!!! Kimi Young"
When starting any business, there are specific forms you'll need to help you get going right away. So I've put together the top 15 business forms (Value: $59.95) I believe you'll need the most to help you. Naturally there are a zillion forms you could use, but these are the most important for setting up your new business and they also come with a brief explanation sheet. You'll get grid paper for doing layouts, Profit & Loss Statement form, a Personal Budget form, an Auto Expense Report form, Operating Expenses Forecast form, a Yearly Travel Expense form, an Annual Profit & Loss form, a Prospecting Sheet, an Invoice form, an Invoice for Work Performed form, an Address and Phone Directory form, an Appointment form, a Phone Call form, a Time Management Log form, and a Phone Memo form. You can print off as many as you like. As I stated above, you'll also get 33 actual furniture arrangement layouts (Value: 69.95) for the main seating arrangements you'll most likely encounter in a living room or family room. These two rooms are the most common rooms in desperate need of re-design out there. These are the rooms you'll most likely be hired to redecorate. So these layouts will serve as a very handy guide to help you resolve just about any decorating dilemma you're likely to run across. No one offers you this kind of detailed training - no one. The most you'll get from my competitors is some guidance on rearranging 2-4 homes, and you won't wind up really understanding arrangement design with so few situations to analyze. I give you 33 arrangements to study and analyze to help you really feel confident from the very first day. To help you even further, I've added a list of 515 Redesign/HomeStaging Business Names (Value: $59.95) which you can choose from or to trigger your own creativity in selecting an appropriate business name. I've tried to cover all of the essential things you either need to know or do to get your new business off the ground as soon as possible. You won't find this kind of detailed help anywhere else. To build any business you have to get the word out and let people know you are there. While other trainers will sell you eBooks or time-wasting seminars, we get you going instantly and even give you a free listing in the fastest growing professional directory, The Academy of Staging and Redesign - Directory. Yes, that's right. It's just one more way we help you launch your business and garner clients without even having to work for them! (Value $100 per year). Value of Bonuses Alone: Priceless! "Barbara, it was great to receive the July newsletter. I purchased several of your courses and subscribed a while ago. I forgot about the newsletter. Is this the first one you've sent over the past 6 months or have I just missed them??!! If I've missed them, how can I get back issues. This one is great! - Regards, Jackie M"
Within minutes you can start your new business as a rearrangement consultant. It's prestigious! It's fun! It's creative! It's easy! You do have to work at it, we won't kid you, so if you're lazy, it's not for you. But if you enjoy people, you crave color and design and creativity, this is where you belong! At least check it out! You can order your copy through our Encrypted Secure Server on line and get instructions on how to download it on to your computer in less than 5 minutes, or you can FAX or mail in your order, using the links below. It takes longer that way, but it's up to you. You can also call in an order during our regular business hours. Order now. Cause if you wait, I guarantee you'll never do it and five years from now you'll be regretting it big time! Ground floor opportunities don't come along all that often. Rearrangement design is just beginning to really take off. Most people haven't heard of it yet -- but many have. Either way, that's good for you, but only if you act soon. Right now there's very little competition and you can jump in and go! But first you need to learn how from someone who has done it for years! this electronic book (which should sell for hundreds of dollars if compared with the high priced seminars) will only be a low, low price of just $99.95 total (downloadable instantly and to be read on your PC computer; Mac users need to purchase printed version) (or $139.95 plus S/H for non-refundable 176 page printed version), our special newly Revised Edition rate. That's more than 60% off - and when you consider you get the free business listing worth $100 per year, you're actually getting this training for practically nothing at all. Incredible! Or if you insist on not getting the directory, get the book only (with newsletter) for $34.95 plus S/H. In addition to that, you should make three times that amount from your first client and recoup your training investment instantly! Don't delay as this price may go up at any time. Due to the rise in digital theft and copyright infringements, this training is no longer refundable. This is an incredible deal, even at 10 times the price. Where else can you start your own business and literally have almost everything you need for less than $100 and get on-going FREE mentoring by the No. 1 Redesign Trainer in the world??? No where but here! "Dear Barbara, I just had to write to you, singing your praises again!!!!! I just re-read the Seven-Step One-Day Marketing Plan, and I'm nearly done writing mine up. THANK YOU THANK YOU THANK YOU!!!!!! You make everything so logical and easy to understand!!! I had been reading an Interior Design-specific marketing handbook and felt like I was reading a foreign language!!!!! Your writing is so much better! Thanks again! - Shelly Landry"
P.S. There are lots of ways to get to top income in the redesign field. You can scrap and struggle and fight and make tons of mistakes to figure it out for yourself, like I did. You can try to piece it together by asking questions. Or you can take the elevator to the top ---- get tried and true tactics and strategies that have worked for me and others, get advanced, vitally important how-to's, lists, forms and essentially the "nuts 'n bolts" of the industry, and you can get it all in the comfort of your home and learn at your convenience. Why climb 50 flights of stairs when the elevator's working???? TESTIMONIAL - "Dear Barbara; My name is Veronica Miedema. I purchased the eBook on Rearrange it. I am also studying Interior design. I have asked God to open doors for me. As I have not worked since I came to the states( originally from Ireland) I was initially aprehensive about buying the book as I wanted to be carefull about spending more money on courses. I am really pleased with the Interior Design Course I am doing. But I wanted to add to credentials. I wanted to give you positive feedback on your book. I found it to be very explanitory. Easy to read and understand. You did an excellent job. I wish you continued success I too believe God has control over where my future is going and I have faith he will give me good direction Sincerely Yours Veronica Miedema"
Let's talk honestly. . . . There is a saying, "When a student is ready, the teacher will appear." I'm not saying you won't get good training in other programs. I do not claim my program is all things to all people. No program can be that. But I just want you to evaluate carefully the differences, especially regarding prices, the level of support you're likely to get and your long term freedom to manage your business as you see fit. Make an informed decision, that's all (and consider putting your investment into building your business, not in training for it). You're not trying to become a doctor, a minister or a full service interior designer. You're merely learning how to more effectively arrange furniture and accessories for people and collect a fee for services. It's a no brainer. Don't be fooled into thinking it's more than it is. Even a teenager could learn this business from me, that's how simple it is. I know it can be confusing trying to decide just what you need to help you be successful in a business like this. So I've broken it down for you into segments to make it as tailored for each person's needs as possible. Some of you are complete novices. Others of you might have some design or business training under your belt already. So no matter what stage you are in, I've covered it all for you and you'll find links to all my training products and services on my home page. But just for those of you who like summaries, here is a link to my recommended over-all training options that will help you easily identify any and all training and/or services that are best for you. "I can't tell you how many times I wanted to email you this last week and just didn't have the time. Well, I home staged 2 homes last week and they both sold already. I did a house on Wednesday and it sold on Thursday after the "Broker's Open". It didn't even make it to "Open House" day. And by the way, the agent who hired me said that all of the agents walking through the house on Thursday kept asking who was the designer and could they get my card. I can't tell you how great I feel. I ABSOLUTELY LOVE THIS CAREER!!!! - Tina Beene"
And remember, you also will be entitled to personalized help from me via my special email address. It's like having me as your own personal mentor looking over your shoulder at no additional charge! and also the free copy of Current Color Trends Report and The Secret Art to Hanging Art eBook, together with my free business development newsletter and my 15 all-important business forms just for this field. And as if that weren't enough, I've also included 33 furniture layouts for family rooms and living rooms to guide you in planning the rearrangement of the most typical scenarios you will run across out in the field. And don't forget the 500+ Business Names you can choose from to jumpstart your business. Unlike my competitors, who only give you 2-4 arrangement experiences, you'll get the advantage of studying 33 real world examples of furniture arrangements that should resolve almost any dilemma you run across. You'll be amazed at how confident you feel after you study these layouts. You won't find these gifts anywhere else either - and if you find something similar, believe me, they copied the idea from me. I can only offer personalized service to my ground floor consultants, so don't miss out. Eventually these bonuses may not be offered at all! So act now while you're here and the iron is hot! TOTAL VALUE OF BONUSES: PRICELESS! I will give you free on-going mentoring advice by email or phone whenever you need it at no additional charge. That is my commitment to you. So if there is any issue that wasn't discussed or not discussed in enough detail, you merely have to drop me an email and I'll give you a personal response to help you achieve your goals. WE SPECIALIZE IN THESE TOPICS: INTERIOR REDESIGN - HOME STAGING - INTERIOR REDESIGN TRAINING - HOME STAGING TRAINING - INTERIOR REDESIGN CLASS - INTERIOR REDESIGN SEMINAR - ARRANGING FURNITURE - FURNITURE ARRANGEMENTS - FURNITURE PLACEMENT - ACCESSORY DESIGN - WALL GROUPING DESIGN - use what you already own DECORATING - HOME THERAPY - CORPORATE ART CONSULTING TRAINING - HANGING ART - HANGING PICTURES - REDESIGN TRAINING AND MUCH, MUCH MORE!